On 17 December, the Commissioner's Office hosted the 2015 Executive Reception. 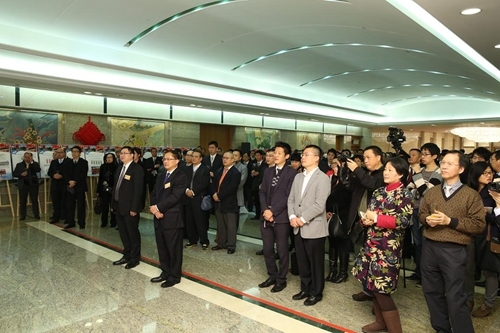 Deputy Commissioner Tong Xiaoling, Deputy Commissioner Hu Jianzhong, Deputy Commissioner Song Ru'an and heads of the Office departments attended the reception, together with about 300 representatives from the SAR government, press, education and business community and social groups of HK. 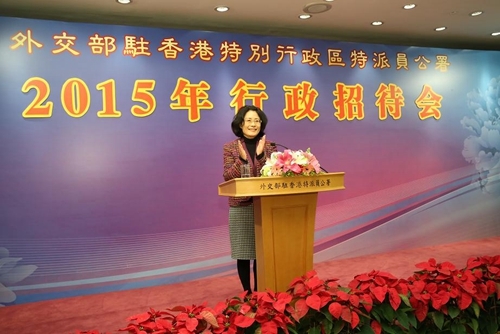 In her remarks, Deputy Commissioner Tong noted that in 2015, the principles of "one country, two systems", "Hong Kong people administrating Hong Kong" and a high degree of autonomy have been effectively implemented, thanks to the full support of the central government and effective administration of the SAR government. The Commissioner's Office provided strong support to the administrative priorities of the SAR government and helped HK to expand external exchanges. It has made an all-out effort to carry out HK-related consular protection and expanded exchanges with different communities in HK. Deputy Commissioner Tong shared three New Year wishes with the guests. First, HK should grasp the opportunities and play the role of "super connector" in the national development to achieve transformation of its own; second, the HK social elites should, all the more, undertake major responsibilities to build and serve HK and contribute positive energy to the implementation of the "one country, two systems" principle, law-based administration of the SAR government, and HK's harmony and stability. Third, the SAR government and different sectors of HK should stay united while HK SAR and the mainland provinces should cooperate as one to overcome whatever difficulties ahead. The Commissioner's Office will work together with all sectors in HK to create a new "Hong Kong miracle" under the guidance of "one country, two systems". The guests expressed thanks to the Commissioner's Office and shared their willingness to closely coordinate with the Office and work together to make fresh contribution to the stability and prosperity of Hong Kong.